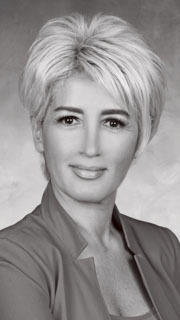 Mojey Ghafouri represents the truly modern real estate broker. She is thoroughly versed in her subject matter and brilliantly focused on the investment side of real estate. Mojey has lived in Bay Area for over 30 years. Mojey's extensive experience lends her astute financial expertise and an insider's understanding of a building's management and inner workings. She provides the purchaser with an invaluable resource - a solid, informed mindset that fuels smart decision-making. Her clients appreciate her thoroughness, consistency, and her insightful guidance. Mojey has traveled the world extensively and uses her broad range of experience and resources to provide investors, buyers, and sellers (both seasoned and new) with maturity and knowledge that guides them toward informed, intelligent choices. As a mother of a child with Cystic Fibroses, she is so passionate about bringing awareness to this killer diseases. She donates part of her commission to CF foundation. Mojey is part of The Luxury Brokers Team, which is consistently ranked as one of the top Broker teams in the United States by the Wall Street Journal. Mojey has appeared in The " Hydra Executives" the first Reality show aired in UAE in February 2009.